Headlining both events is talented Dhaka based electronic producer – Som Saha a.k.a. Space/Ghost. He’ll be playing alongside some top-notch homegrown electronic artists, more information for which you can find here. We decided it was time to alert the Indian music community of the steadily increasing talent emerging from the region and appreciate the mind behind the music of Space/Ghost. The upsurge of electronic music in Dhaka over the last couple years is one worth noting. 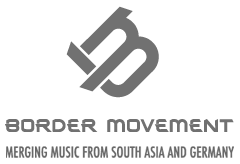 Those of you following Border Movement would know of the Dhaka Electronica Scene – a budding musical collective based out of (you guessed it), Bangladesh, is gradually gaining attention from the international community as a burgeoning experimental music and cultural space in the region. As a member of that community, Saha states that the young team do what they do “out of love”. Although he hasn’t released a comprehensive body of work so far, Space/Ghost’s sound is instantly recognizable. With numerous comparisons to early Daft Punk (think 2007’s ‘Alive’), the obvious influence of French electronica and an affinity for manipulated robot voices, his output can’t really be compared to anything we have in India (that I can think of). His single ‘24/7’ (featured in the ‘Melankoli’ compilation) and stellar stand-alone track ‘Kimosabe’ are proof of that. Both singles are worth a listen with their reverberating manufactured vocals and pulsating bass lines. His dark, undulating collaborative track created along with fellow DES member B Regiment for the compilation‘Nyurutsu’ is called ‘Niharika’, and features old Bangla tunes layered over abrasive percussion, infectious, looping bass and what seems to be the sound of chirping crickets. The incredible video below was found on Kaaktalio’s blog and features the artist playing with an “interactive music installation” (created along with Humayan Islam) that seems to translate human movement to sound and reminds one, a little bit, of a new age Theremin. “The installation is an experiment to make music react with motion detection, but it’s still in its early stages. I wanted to be a scientist but that didn’t work out, probably because I flunked a lot. I hope it gets better with time.” The installation is under works for an upcoming event in Dhaka, set to take place in December. Space/Ghost will be performing all new original music, which was created over the last few months at Hauz Khas Social tonight (Wednesday 29 October), and it shouldn’t take much convincing for you to come, have a listen and see what you make of it. More than anything, round 2 of the Border Movement Lounge, once more, allows us to explore a side to electronica that we may not have seen before, and presents itself as an opportunity for Delhi and Kolkata folk to delve into an innovative musical space that extends beyond the tired confines of our cities.